I’ve been shooting a lot of seascapes lately and feel that I need to interrupt this constant flow of “rocks in the water” images with something dry. 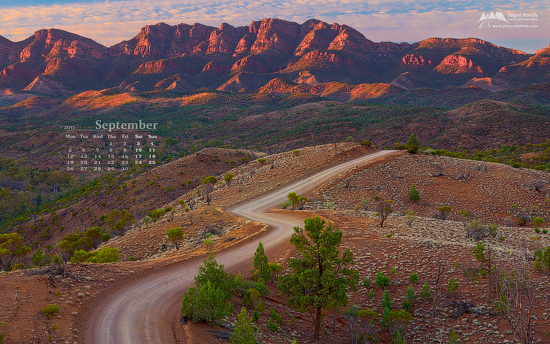 The image I chose for the new calendar wallpaper presents an iconic view of the Flinders Ranges (South Australia) – Bunyeroo Valley from Razorback Lookout. If you are interested to learn more about Flinders Ranges, a good way to start is to read my “Flinders Ranges: Highlights” article in the travel section of my website. All previously posted wallpapers with fresh calendar are available for download here: Free Desktop Wallpaper Calendars. Over 100 images from my portfolio are also available as high-resolution wallpapers for Android devices. App also supports Flickr, Facebook and Picasa, so you can use your own image as well as images from my portfolio as wallpapers for your Android.